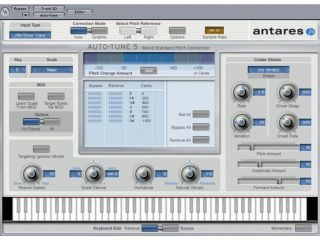 Auto-Tune can be used both correctively and creatively. 1. Always keep notes on the session! Write down what equipment you used to record, including full signal paths through any outboard gear. Take down the names of all singers involved and note the tempo, key, session date, name of song, name of the client (should you be lucky enough to have one), producer, arranger, etc. Write down everything! Keep these notes in the song´s project folder and file a hard copy. 2. Take care to avoid cutting off breath noises, as they can make a vocal sound more natural. Taking them out will result in a very artificial sounding mix. Obviously, any other noises made by the singer in between lines (mumbling, coughing, throat-clearing, etc) will need removing, though. 3. Make sure the singer has herbal tea and honey available. Herbal tea and honey is the perfect combination for lubricating a singer´s throat when recording. Cough sweets are also good things to have on hand, for soothing any sore or dry throats. 4. It´s a good idea have fresh water available in the studio as well, at both room temperature and cold. 5. Always have notepads and pencils to hand for the singer, the engineer and the producer/client. 6. Everybody present should have a lyric sheet. Whether you´re recording rap, dance, pop, country, rock or jazz, this is a necessity, from the initial vocal recording through to comping and mixing. 7. Render out several different final mixes, each with the vocals at different levels. Name them ‘Lead vocal loud´, ‘Lead vocal lower´, and so on. A vocal level that sounds great after four hours of mixing might not be so good the next day, when your ears have recovered. 8. If you´re having trouble getting the presence you want on your vocal, try an enhancement plug-in, such as BBE´s Sonic Maximizer. Although not as commonly used these days as they once were, they´re sometimes exactly what´s required to make a vocal stand out. 9. For a really cool effect that never goes out of style, send the vocal out to a guitar amp and re-record it through a microphone onto another track. 10. Don´t be afraid to use a vocoder plug-in on spoken sections. Yes, we know it´s been done to death but it still works when deployed tastefully. 11. Similarly, try the extreme Auto-Tune effect from Cher´s Believe. Turn the Sensitivity on the Auto-Tune plug-in all the way up, and set the Speed to very, very fast. Every note will quickly leap to the correct pitch. Then send that to a vocoder. Total cliché though it may be, it´s an effect we still hear in new releases occasionally - it´s up to you to find an innovative new way to use it. 12. Distortion is a vital tool in vocal production. Whether it´s Justin Timberlake´s SexyBack delivery, The White Stripes´ characteristic vocal sound, or the darker, more sinister tones of metal, it´s always an effect that gets people´s attention. It´s especially effective when only used on certain sections, rather than all the way through the song (the zillion-selling, relentlessly distorted SexyBack being a notable exception!). 13. Finally, as with all aspects of music production, always remember that there are no rules that can´t be broken. If it sounds great, then it is great! For a comprehensive guide to recording, editing and mixing vocals, check out issue 123 of Computer Music magazine.